This myth, popularized in the 90′s, that very high repetitions of very light weights would result in a toned physique, has become outdated. These high repetitions will increase your muscular endurance but will not add strength or tone. Roasted veggies are low in calories and high in fiber, making them the perfect diet food. This dish will fill you up without adding too many calories to your daily tally. Add a side of lean protein for a complete meal. Cut the eggplants in half, lengthwise, and scoop out the flesh, leaving 1/2 inch on the shell. Chop the scooped-out flesh into 1/2 inch cubes and set in a colander. 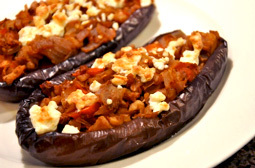 Sprinkle the eggplant cubes and the inside of the eggplant shells with salt. Let stand for 30 minutes, then rinse and pat dry. My Fitness Pal: This app is free and works on the Web, Iphone, Ipad, Android, BlackBerry and Windows phones. iChange: This app is free and works on the Web, Iphone, Ipad, Android or Blackberry. Try out different food journal apps until you find one that is easy for you to use, works well with your phone and makes tracking your calories simple and fun. If you decide to use one of these, let me know when you are setting up your account and I will help you set up your nutritional values and parameters based on your goals, as well as helping you connect with my account so I can help make sure you are on track for your goals! Once you decide which app works for you, now it’s time to get journaling! Stay within your target calorie range and watch as the pounds drop. By now you’ve just about had it. You’ve been exercising and eating healthy for ages, but haven’t met your weight loss goal. It’s an issue that every whole-grain-veggie-and-lean-meat-eating health-seeker faces at some point in their fitness journey. Until you come face-to-face with one ugly truth about yourself, you’ll always be stuck in this limbo of doing the right thing, eating healthy and yet not having the stunning body to show for it. Once you conquer this last issue, you’ll quickly achieve your ultimate goal and will slide into the on-going maintenance phase. Here’s your problem: You eat too many calories. Master this problem and you’ll quickly and easily achieve the body of your dreams. “But I only eat healthy calories, so quantity doesn’t really matter,” you’re thinking. While I applaud you for eating healthy calories, you’re fooling yourself if you think quantity isn’t an issue. Have you heard of the professor from Kansas State University, Mark Haub, and his famous junk food diet? As an experiment for his nutrition class, Haub put himself on a diet of almost exclusively candy bars, packaged cakes and processed snacks. The catch was that he only ate 1800 calories each day – when his previous diet, of normal and healthy foods, was about 2600 calories each day. Within two months Haub had lost 30 pounds and his BMI dropped from the overweight category down to normal. While I would never recommend eating junk food, this is quite a dramatic demonstration of how reduced calorie intake works for weight loss. If you don’t know the answer, then get excited because this one weight loss tool will change everything for you. Food journaling used to be a cumbersome act that involved lugging around a journal, writing down each food item throughout the day then looking everything up at the end of the day to manually tally calories. Today food journaling has gone digital. Tracking calories takes only seconds of your time. Download a food journal application to your smart phone and at the touch of your fingers you’ll be able to look up food items and instantly see your running calorie tally. Meet with your doctor to determine a daily calorie count that will allow for safe weight loss and diligently maintain that number. Eat healthy, fresh foods and when you decide to indulge, do so within your target calorie range. This one small, proactive step will give you structure and clarity when it comes to making food choices and will quickly result in pounds lost and goals achieved. Once your goal weight is met, your target calorie range will be adjusted for maintenance. To meet your weight loss goal quicker, pair your calorie-specific eating with a consistent and challenging exercise routine. My exercise programs are specifically crafted to get you into amazing shape. Download a food journal application to your smart phone and at the touch of your fingers you’ll be able to look up food items and instantly see your running calorie tally.. I like ichange and myfitnesspal. Email if you are going to sign up and I will tell you how to connect with my account so I can help advise you and your eating habits! Place the eggs in a pan of water; bring to a simmer for 6 minutes. Remove from heat. Crack the eggs all over, and then place in a pan of cold water for one minute. Remove from water, peel, and slice. Set aside. Bring a medium pot of salted water to boil. Add the asparagus and cook for 4 minutes. Rinse in cold water then set aside. 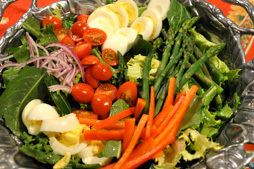 In a large salad bowl combine the endive, dandelion greens, tomato, onion and pepper. In a small bowl combine the Stevia, lime juice, garlic, Dijon and vinegar. Mix well. Coat the salad with the dressing. Top with asparagus and sliced egg. Nutritional Analysis: One serving equals: 119 calories, 5.5 fat, 137mg sodium, 9g carbohydrates, 2g fiber, and 8g protein. Maximizing fitness, athleticism and performance in the world of endurance athletics is easier said than done. Many athletes focus too much of their effort on just the training component. To see consistent improvement, however, athletes should create an entire system to round out their training program. Endurance athletes are tremendously hard workers, but sometimes this hard work will come back tohaunt them as injury and pain tend to creep up in those who work too hard. Training is the foundation to getting results, but there are other components that make up the complete system. These other components need attention; and when they are disregarded, an athlete does not maximize their true potential. Work on these six components to round out your complete triathlon training system. Solid nutrition principles are imperative to staying healthy and injury-free, and truly maximizing your performance. When your diet is incomplete and lacking the nutrients and vitamins the human body needs to perform, recover and stay healthy, your training program will become stagnate. As training is crucial, the nutrition program is just as imperative to an endurance athlete. Vigorous training hours lead to fatigue, broken down muscle tissue, tired joints, a run down nervous system and an immune system fighting to stay healthy. Without a proper nutrition plan to assist recovery and replenishment, your body will spiral downward to a state of overtraining, which can lead to inconsistent sleep patterns, lack of motivation, and ultimately injury. I use this as component #1 because there isn’t enough focus on this tactic. Without changing any of the other training protocols, tweaking nutrition for peak performance can give endurance athletes an edge on their competitors. An endurance athlete’s diet should be full of complex carbohydrates like fruits, vegetables and healthy whole grains; lean proteins like fresh and lean chicken, turkey, fish and occasional red meat; and healthy fats like natural peanut or almond butter, avocado, raw nuts and olive oil. Keeping your food consumption to calories that are nutrient-dense and limited in saturated fats, high amounts of sugars and salts and empty calories is imperative for high-level performance. Food timing is another critical aspect to understand. What you eat is important but dialing in your nutrient timing can expand your performance to optimal levels. Understanding what specific foods do for your system can assist your energy levels, increase the intensity of your workouts, and allow your body to fully recover after training. Pre-workout food consumption is dependant on each individual and the needs of that person. Find what works best for your body. Do not rely on what you saw in a magazine or read in a book. What works for you? The basic nutrient breakdown before training should consist of a 4 to 1 ratio of carbohydrates to protein. This ratio will top off the glycogen tank to prepare for the work ahead. This pre-workout meal should not be heavy, fiber-dense or packed with empty sugar and calories. Instead aim for calories that will give you the necessary energy and jumpstart you will need to begin training, without overworking the digestive system. g this period. Whey protein, chocolate milk and your favorite supplement (HL 24 Recovery, hammer nutrition, etc) are all good choices. After your post-workout snack immediately following the completion of your training, you now have a one-hour window to consume natural whole food. Aim for lean protein sources like eggs, chicken, fish or legumes and complex carbohydrates like quinoa, vegetables and fruit. And don’t forget your healthy fats. Post workout is a time to nourish the body with omega 3 and 6 nutrients to repair muscle damage and decrease inflammation. Training progressively and smart is a tactic many athletes do not follow. A randomized training schedule is the method most amateur endurance athletes tend to use. They train depending on what they want to do for that particular day. There isn’t a plan of action, no progressive build up, no planned rest days and limited structured workouts. These are strategies that must change in order to fully reach an ultimate performance level. The first step is setting up a structured training program that fits your needs and goals. Write down the top three objectives that you want to accomplish over the training period. Get faster at the half marathon distance. Get stronger on the bike. Never increase volume more than 10 percent each week. Every fourth week decrease your highest volume week by 40 percent. This is a recovery week and will allow your body to fully adapt to the training block. You never want to have back-to-back training days that are both high intensity workouts. Stick to the “easy/hard/easy/hard” set up for your workouts. Find your “A” race and plan your training backwards from the scheduled day to the present. This will allow your peak to happen for your most important race. Trying to peak for every race of the year will lead to lack of performance and ultimately injury. Listen to your body. If your body is in a fatigue state and just can’t get through a specific workout, call it a day. Recognize the difference between being a sissy and just having mental and physical fatigue. You should implement a base phase to build your aerobic capacity, a build phase where you implement more race pace strategies, a peak phase where you are preparing for the demands of the race, a taper period where you allow for full recovery and adaptation from all of your training, and a transition period with time off to allow for full physical and mental regeneration. These periods will set you up for a successful training year. The human body is very resilient and can take training loads at extreme rates. But the human body does break down and it’s what you do during your recovery time that allows you to build and improve performance. During workouts, we break down muscle tissue, deplete our energy stores and we create nervous system fatigue. When our nervous system is fatigued it doesn’t matter what we do for our training, we will not get better. We will be in a constant state of overtraining, causing compensation, breakdown and ultimately injury. You must plan and schedule rest days, rest weeks and transition periods into a training program. Foam Roll/Stretch: You need to schedule flexibility sessions into your training week. After long weekends of training your muscle tissue becomes inflamed and tight, and adhesions form throughout the fascia. Rolling and soft tissue therapy will help get rid of the small knots and adhesions that build up over time. Plus it will help promote blood flow, which gives you better movement and range of motion. Endurance athletes should focus on the quads, hamstrings, glutes, calves, IT band and thoracic spine (mid-back). Stretching also needs to be implemented into the schedule. Stretching the muscle will help lengthen the fascia to allow for proper movement and range of motion. If your muscles are tight you may restrict movement, decrease your performance and eventually get hurt. Take time to roll and stretch. Ice: After long and/or hard training sessions icing the legs is a great way to get them to recover at a more rapid pace. Icing will decrease inflammation and swelling, and enhance healing. But more isn’t necessarily better when it comes to icing. You should ice your legs for no longer than 15 minutes an hour. Any longer can cause damage to the surrounding muscle tissues. If you have a direct pain site (i.e. shin splints, plantar fasciitis, etc. ), then ice massage is the way to go. Simply freeze a small water bottle, cut the bottom half of plastic off the bottle to expose the ice and then massage the affected area. Do this for only five minutes each hour. Light movement: After a race or a big weekend of training, the best thing for your legs is to flushthem out the day after. Know the difference of a hard workout and easy moving. These lighter workouts can tremendously assist recovery as they will get your legs through a range of motion, help increase blood flow, decrease inflammation, and promote recovery. Just make sure to keep these workouts very light. Spinning on a bike or a light recovery swim on Monday, following a big training weekend or race, will assist the body to recover and allow for a better week ahead of training. Corrective Exercise: I wrote an article called 6 Exercises for a Balanced Body. Implement these six moves into your routine to create a balanced and more functional body. Consistent Sleep: When the body is at rest, it will be at its greatest state of recovery. If you are not getting consistent sleep throughout the week you will suffer, breakdown and be more prone to injury, fatigue and burnout. Endurance athletes are continually breaking down the body during training and it is a must to get adequate sleep. The key is consistency. So six hours of sleep every night is better than four hours one night, eight hours the next, and five hours another. Aim for six to eight hours each night. During the day, try to fit in short 15- to 30-minute naps to rejuvenate and recharge the body and mind. When you lack functional movement and range of motion in your joints and muscles, you do not maximize performance. Swimming, biking and running are all repetitive sports that can create stress and imbalance, causing the body to compensation for lack of movement in other areas. It’s important to have adequate flexibility in the muscles, and mobility in specific joints, to decrease overuse injury in multisport. When you become tight and restrict movement, your body starts to compensate, thus forcing other parts of the body to work harder than they have to, which will eventually cause pain and injury. Mike Boyle and Gray Cook came up with the “Joint by Joint” concept that looks at each joint’s function from the ground up. Before every workout you should warm up using this joint by joint theory. You will set yourself up for a higher-level training session when you learn to warm up the entire system. During the week, schedule times to foam roll, stretch, and work on your mobility. Just keep in mind, when you get hurt you can’t train, and if you are not training you will not get better. Implement flexibility and mobility work into your training program at least three times a week to see improvement and reduce injury. If you lack specific strength and power, you will not maximize your performance in your sport. Functional strength is having usable strength that will transfer to the “playing field”. Plain and simple, the stronger athletes excel. As endurance athletes are very focused on their specific training they tend to forget about their functional strength and explosiveness. These traits can lead to better performance and reduction of injury. Implement strength workouts into the training program that promotes muscle balance, stability and explosiveness. imbalance, a weak muscle system and poor movement qualities. Plan and perfect your movements in the gym. For every upper pushing exercise, add an upper body pull. When lifting, focus on perfecting movement, not on high-repetition work. Do not let your form suffer. The first step to achieving any of your goals is the power of believing in yourself. You must create a positive mindset that consistently has you believing in your abilities. If you show up to the gym or to one of your workouts with a negative, non-believing attitude you will have a lack-luster training session. Mental conditioning needs to be worked on just as much as physical conditioning. We need to teach and train our thoughts to be positive. Did you know that 80 percent of most humans’ thoughts are negative thoughts? The crazy thing about that is we can do something about it: We can change our attitude, our thoughts and our mindset. But just like we prepare and train for a 5K or marathon to get faster, we must put in the mental training to improve our mental performance. Just like training the body to get faster, stronger and more athletic, we have to train our thoughts to become more positive, energetic and confident. It takes daily work for this to happen. These thoughts will turn into actions and you will see a tremendous change in your mindset and your life. You have to be conscious of this exercise, as it is very easy to just get out of bed and “get through another day”. Remember each day is a new beginning, a fresh start, and a brand new chance to create greatness. We cannot focus on yesterday but having a good and better yet GREAT today will make for a better tomorrow. Secondly, after a long day, when you are lying in bed about to fall asleep, finish the day with a positive thought. “I did my best today”; “I am so happy to be alive and tomorrow will be another good day”; “Good job on your effort today”. Starting and ending your day with positive affirmations can be a game-changer. Believe in yourself at all Times. You must learn to believe in yourself. Do not put yourself down or have disbelief in accomplishing a certain project, or workout, or task. No matter the task at hand, do the work necessary to succeed. If you have the action and the mindset, you will accomplish it. Believe in that and you will start doing big things. Try meditation. Have you ever sat in a room or in your car with complete quietness, your eyes shut and focused on your internal thoughts? Try doing this for three to five minutes everyday. Do it before your workout, before you step into your office or before a big race. Meditation can relax your mind, help get you centered and focused, and energize your thoughts. Focus on zoning out and direct your attention on your thoughts and your internal motivations. What drives, inspires and motivates you? This internal conditioning can be a supercharge in energy that you have been looking for. Positive self-talk. This one goes hand in hand with endurance performance. During workouts and training you must create a positive self-awareness that will lead to successful performance. It’s easy to talk ourselves into stopping short of the recommended distance or the last few intervals. Continually tell yourself that you can do the mileage and you can push through the tough intervals. This will transfer over to your racing as when you are pushing and giving it your all, you will be able to push through that uncomfortable zone and have a successful race. Your performance goes in the right direction when you think positively. Write down all of your goals. This can be a road map to a successful training program. What do you want? A faster 5K? To train for an Ironman? At the end of each season, you need to assess the previous season. What were your strengths? What were your weaknesses? What will be your goals for the next season? Goals are just random ideas and thoughts until they are written down. Create a game plan that you can look at everyday. If your goals are in sight every morning when you wake up, you are more likely to stay on track to accomplish those goals. The next step is showing your goals to a mentor or coach. This helps hold you accountable to achieving your goals. Meet with that person periodically to talk about where you are at and what you need to do to stay on track. As you work toward incorporating the six elements of this training system, you may not only see a dramatic change in your performance, but also your vitality and the way you live life. Find a triathlon training program. Most people believe they’re making a smart diet choice by opting for a salad, but end up sabotaging their weight loss goals. Don’t get me wrong – salads are a great way to get your recommended daily allowance of fruits and veggies and are often full of nutritious goodness. 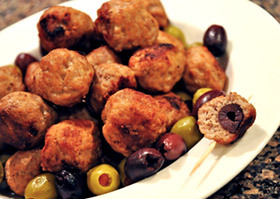 Made with the right foods they can also be a great meal for those seeking to lose some weight. Next time you inspect the salad bar or your refrigerator for ingredients to toss in your salad, keep the following tips in mind. If meat or animal products aren’t your thing, add about three quarters cup of one or more of these protein sources to your salad: lentils, tofu, black beans, garbanzo beans, chickpeas, or a small amount of nuts (they’re also high in fat, so don’t over-do them). If you love the taste and texture of croutons, try crushing a few and sprinkling them over your salad. If your salad doesn’t seem complete without cheese, try a strong flavored cheese like Feta or Parmesan. A small amount will go far. Also, use chopped nuts instead of whole to get more bites of a good thing. Dressing often makes the salad. Unfortunately, it can also make a salad a high-calorie event. The average vinaigrette contains 50 calories in one tablespoon, while the same amount of ranch dressing contains about 90 calories. Plastic containers or dressing packets at restaurants contain four tablespoons of dressing. The entire packet adds an additional 200-360 calories. As if that weren’t enough, many dressings also contain saturated fat. This raises cholesterol and the risk of heart disease. It’s my goal to get you into the best shape of your life. Call or email me today to begin your transformation.